Before I start telling you about my shawl, I'd just like to let you know that Episode 7 of the podcast is now live and can be heard, and the show notes read, here. 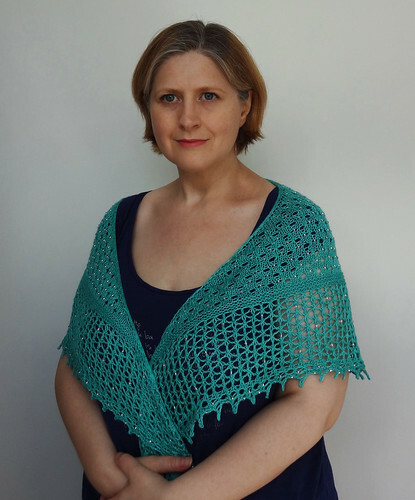 As part of The Knitmore Girls Summer of Lace and Beads KAL, I decided to cast on a lovely glamorous shawl. I don't really wear them much, but that doesn't stop me from enjoying their construction. I decided on the pattern Glitz at the Ritz by Helen Stewart, which is free from Knitty, and then did nothing. I did nothing some more and then I dug out some yarn. Wharfedale Woolworks 4 ply Merino/Silk in Creme de Menthe that had been wound for some time waiting for the right project. 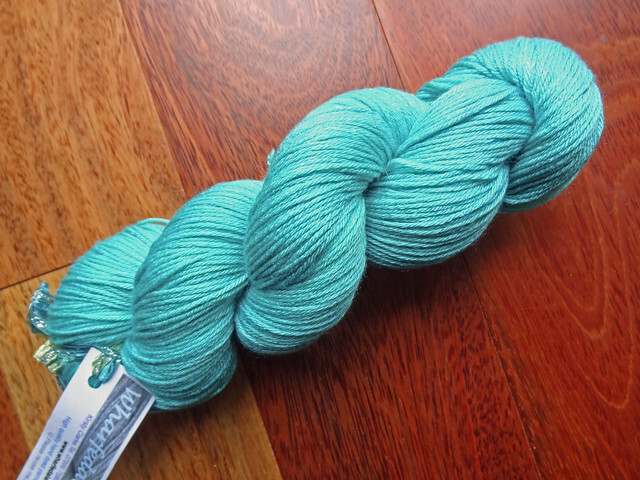 It's a dreamy yarn and I thought it would be perfect for this project. I then did nothing some more and decided I had better get off my backside and order some beads. I got size 6 beads from Charisma Beads and they were transparent with a silver lining. This means they reflect the colour of the yarn so aren't too bold, but they also catch the light better than simple transparent beads. I eventually got round to casting on and decided after seeing a Fleegle Beader on the Tall Yarns n Tales website I would see how it worked. I found Fleegle's blog post about applying beads and decided NOT to get the Beader and instead to try making my own hook with tiger tail mainly because I don't bead often enough to make getting a Fleegle Beader worthwhile, but also because I had the materials to try using tiger tail. I highly recommend the tutorial as it has several different techniques for applying beads with incredibly clear photos. I won't replicate Fleegle's excellent work. Suffice to say, I found it a brilliant technique and soon I was flying along! 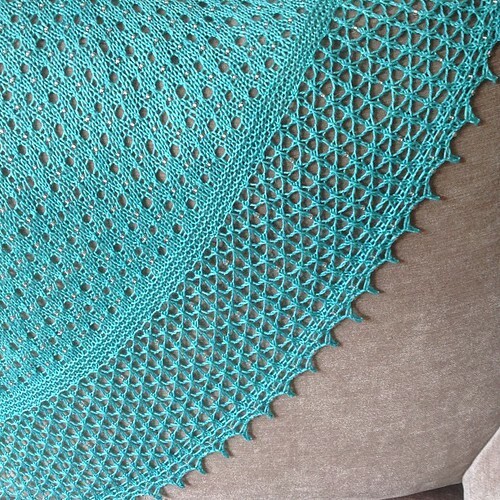 I really like how the edging is done on this shawl. The first and last 2 stitches of each row are knit and the third and third to last stitch is done in stocking stitch, before performing the edge increase. I'd not seen the selvedge done this way before, but I really like how it looks. I also liked using M1L and M1R around the centre stitch instead of performing yarn overs, to give a crisp line down the centre of the shawl. I got a message from the designer after she saw I was working on the shawl to give me some errata, which I think was very good of her. She obviously saw that I'd linked the pattern to the KAL thread on Ravelry and wanted to tell me about the correction. That correction is now on the Knitty website, so I don't need to tell you what it was! This pattern uses an awful lot of beads, so I'm pleased I found an efficient way to apply them. The first section has a beads every 4th row, so you do get some rest. 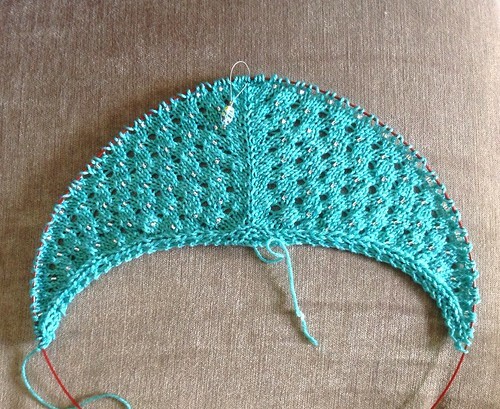 The second lace section has much fewer beads, but the beaded picot bind off was a killer. Which I'd finished though, I knew it had been worth it. The edging looks amazing and it hangs beautifully. I love the way this shawl sits on my shoulders. The additional weight of the beads works with the drape of the merino/silk to hang elegantly. It is a nice wide shawl too, which is the style I prefer. It doesn't have a sharp point at the base of the shawl so it hugs the back of my waist. I adore this shawl and I really wish I had somewhere to wear it. I am sort of tempted to give it to my friend, who it would really suit, as she goes to fancy dinners with her work. She would definitely have somewhere to wear it and she would look amazing in it. I am only considering it because I already have a gorgeous beaded silk shawl that I made earlier in the year, that I have only worn once! 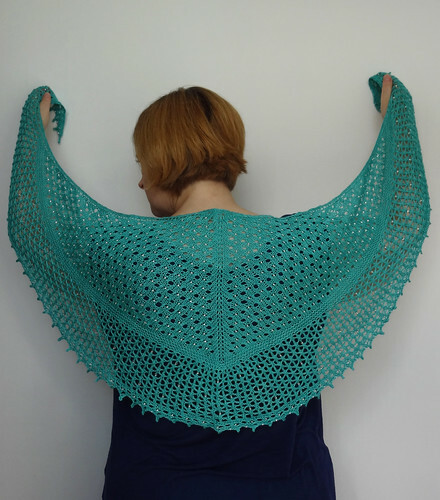 By the way, that shawl pattern has now been released and is on sale for £3.50 on Ravelry. This shawl has reminded me that I do like beaded knits, especially with my new tiger tail technique. Even if I don't get to wear them often enough, there may be more of them in my future. To see other finished objects, click on the button.